The Fx15a/25a/35a eliminates thru-bolts, a design that results from years of engineering refinement and field experience. These small series breakers incorporate moving parts that simplify the hammer operation and reduce the chance of downtime. The advanced hydraulic circuit provides increased flow to the valve and piston, resulting in faster cycle times, increased tool penetration and more productivity per hour than on previous models. There are no Thru-bolts to constantly torque or replace and the front wear bushing is easily replaced so your hammer is always in perfect working condition. 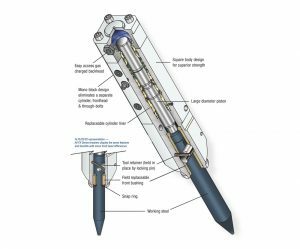 The wider oil flow range is an example of the hammers superior design, allowing for faster striking speeds and the ability to be used on a wider range of carriers. The nitrogen charged backhead increases the impact energy maximizing hammer production. In the rare event that maintenance is needed, the Fxa Series has been designed with replaceable cylinder liners saving maintenance cost and downtime. Due to a small footprint, these breakers are ideal for use in tight work envelopes, sidewalk, driveway removal or any other demolition task. 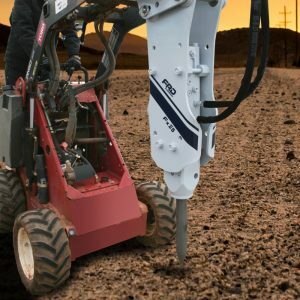 The Fx15a, Fx25a and Fx35a are available for use on mini-excavators, compact utility loaders and skid steer loaders. The Fx35a Qt is for use in environments where excessive noise levels are a consideration. Mounting options are endless and can accommodate any carrier, or a combination of carriers or specific application. Mono-block design with only two moving parts reduces maintenance. Replaceable front wear bushing keeps tools in peak performance. Wide oil flow range for fast, hard-hitting performance and more carrier options. A variety of mounting options that can accommodate any carrier or application. Accommodates a wide variety of working steels. Includes two-year warranty with registration.